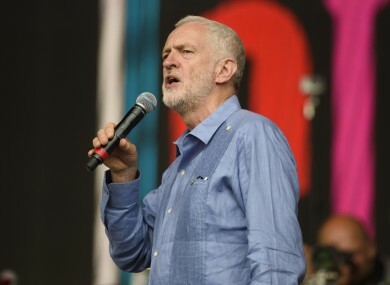 UK LABOUR PARTY leader Jeremy Corbyn got a rapturous welcome from tens of thousands of revellers at the Glastonbury music festival this afternoon. The Labour leader took to the stage at a festival that took a political turn this year, two weeks after a general election. “Another world is possible,” the 68-year-old veteran socialist told the crowd in a speech that focussed on his pacifist, environmentalist, anti-racist policies. Corbyn also pledged his support for refugees and young people and said that the politics of US President Donald Trump would be “put back in a box”. Among the signs held up by festival-goers were “JC Hope” written in a red heart and “Jeremy Corbyn New Era”, while some wore T-shirts with Corbyn’s face. As he did during the election campaign, Corbyn also quoted a poem by 19th-century British revolutionary poet Percy Bysshe Shelley saying: “Rise, like lions after slumber… In unvanquishable number”. Corbyn has said he will try to force an early general election, dismissing the chances of a Tory government surviving with DUP support as ludicrous. His comments in an interview with the Daily Mirror come following his best ever poll ratings as Labour leader, just two weeks after the general election. Theresa May had a 40 point lead in terms of whether the public had a favourable opinion of the political leaders in a poll conducted by YouGov in April, but that has swung completely with Jeremy Corbyn now a point ahead of her according to the latest data. Speaking about the poll, Corbyn said that he was “very happy if people are prepared to vote Labour again”. The Islington North MP also went on the attack on the time that has elapsed so far as the Conservatives try to broker a deal that will see it supported by the DUP. He said: “Mrs May called the election so not to have a coalition of chaos, but that is exactly what we have got, they don’t seem to have come to an agreement with the DUP two weeks after the election. We will challenge this government at every step and try to force an early general election. While the Conservatives won the most seats in this month’s general election, they fell short of a majority despite having enjoyed one before the election was called. Labour outperformed expectations in the election, turning what was predicted to be a procession for May into a disaster, severely weakening her authority as Britain kicks off crucial Brexit talks. MPs will vote on May’s legislative agenda next week, and opposition parties have vowed to block her programme in what is traditionally seen as a test of confidence in the government. Email “'Rise, like lions after slumber': Jeremy Corbyn got a rapturous reception at Glastonbury today”. Feedback on “'Rise, like lions after slumber': Jeremy Corbyn got a rapturous reception at Glastonbury today”.